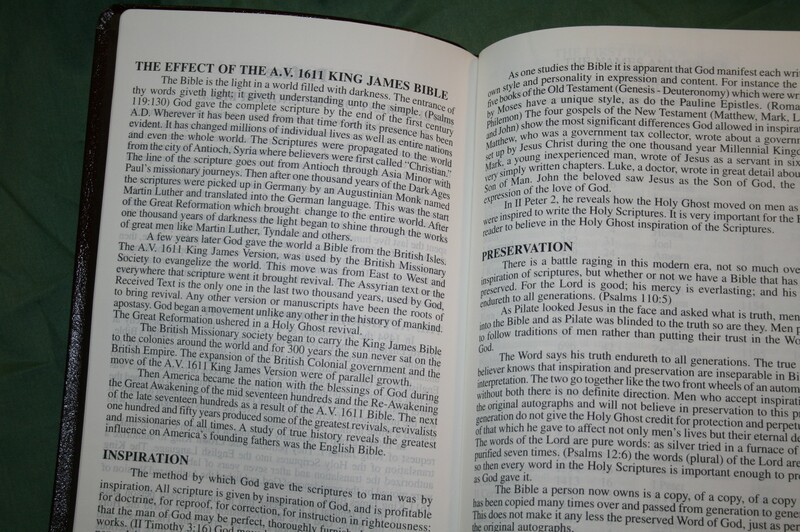 The KJV Subject Bible from Dr. Everette Gaddy and Power Publishing is a take on the Analytical Bible that was produced by Wilmore in the early 1900’s (if not earlier) and later in a smaller and more normal ‘study Bible’ size by Dugan and Jubilee in the 1980’s-90’s. It has gone through many iterations over the years. One of these iterations was published by Campus Crusade in the 1970’s. I was recently informed by a Facebook friend that he was sending me this Bible. Out of the blue… just like that. Out of the kindness of his heart and I am extremely grateful. I’ve wanted this one for a long time and I greatly appreciate him giving me this Bible. 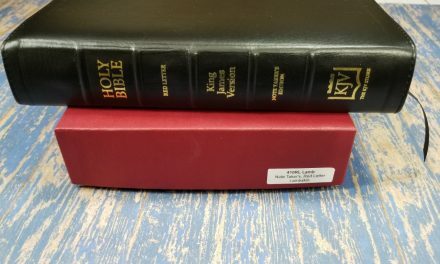 The KJV Subject Bible still has every verse in the entire Bible printed twice, once in regular format and once under a specific topic, but it has made some changes. 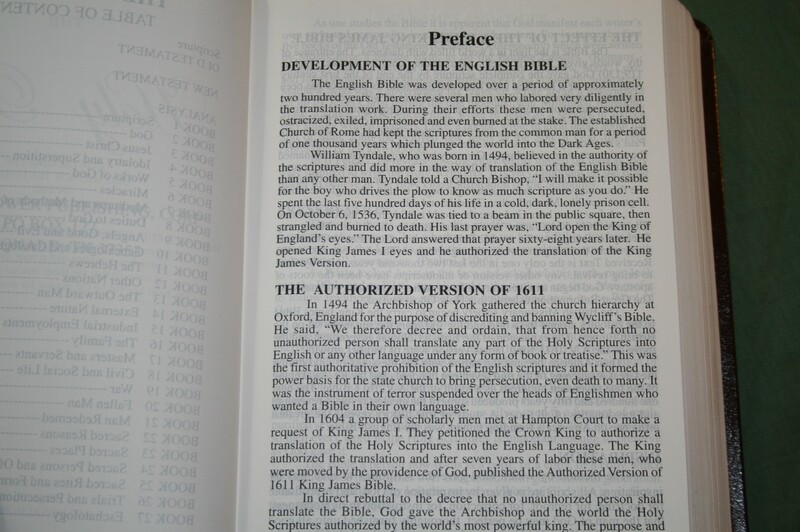 It removes many of the features found in the Dugan and Jubilee editions. 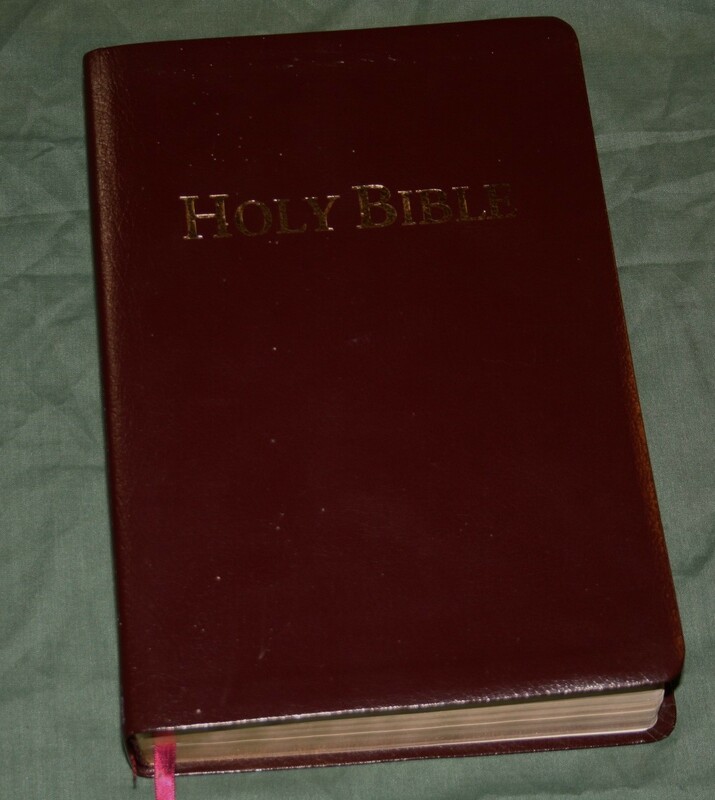 With features removed can it still be a useful study Bible? This edition is burgundy bonded leather with a paste-down liner. It shows very little signs of wear. It’s flexible and I love the color. The newer editions are black and brown Italian Duo-Tone. I like the look of all of them. It’s sewn and lays open in Genesis. This is about the same size as a Thompson. Overall dimensions are 6 ¾ x 9 ¾ x 1 5/8. The paper is thin, which is to be expected for a Bible with over 2500 pages. The opacity is about what I expect for paper this thin. It’s mostly noticeable where there is no text on the page, such as chapter breaks. It actually looks better than in the images I’ve seen online. It has a slight cream tint. There are 36 blank pages in the back for notes. The font is 12-point. It’s dark and very readable throughout. The red letter is extremely bright and stands out. It’s also consistent throughout. The font is one of the reason’s I’ve stopped using the Dugan edition. The Dugan has an 8-point that’s lighter than I want and fades from one page to another. The red is also too light. I’ve tried preaching from it and I keep going to another Bible because the text is too difficult to see for public reading. This edition fixes all of those complaints. For reading and preaching I’ll take the Subject Bible over the Dugan. I do have one complaint about the print, and I consider it a minor complaint. The verse numbers are left-justified and even though they’re 12 point they can be a little difficult to find in a glance. Not always, but often enough to mention. In the margins you’ll find the page number where that verse will be found in the analysis in the back. 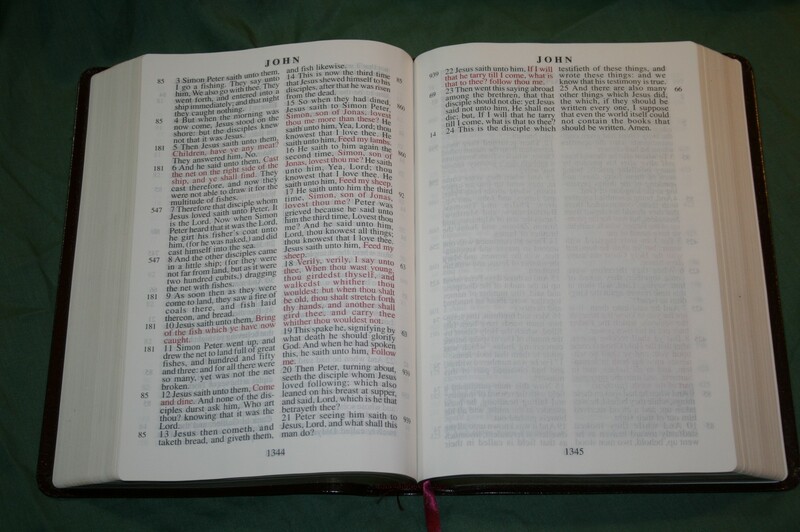 There isn’t as much upper and lower margin as most Bibles. It doesn’t have book or chapter numbers in the header. That would help when you’re turning to verses while preaching or teaching. Within the text there are underlined words. These are archaic words and are defined at the end of the verse. I find this very helpful for those times I need to explain words that I don’t know off the top of my head. For LORD in the Old Testament it will identify when YHVH is used in the Hebrew. 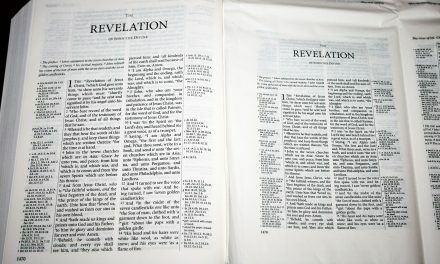 There are a few articles in the front with some info about the Subject Bible and the KJV. The Jewish Calendar is presented as a single chart. The topical analysis is also in larger print than in the other editions. I’m guessing it’s around a 10 point and it’s consistently dark. I can actually preach from this one. The analysis is an excellent tool for sermon prep, research, personal study, devotions, class prep, etc. 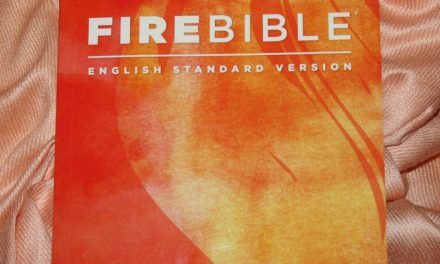 The advantage in this type of study Bible is there is no commentary. It lets Scripture interpret Scripture and gives you the tools to do topical study. Of course the topics can also be a matter of opinion, so there’s still a need (and will always be a need – just as there should be) to do your own study and not just rely on tools to provide the verses for you. This is a 47 page index that includes every topic with the page number of where you’ll find the topic in the analysis. 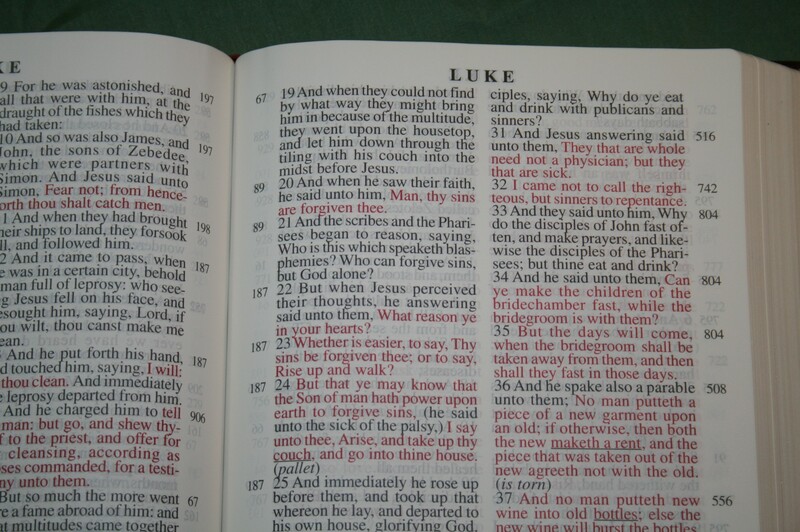 It gives you the page numbers where you can find the subject in the regular Bible section and in the analysis section. 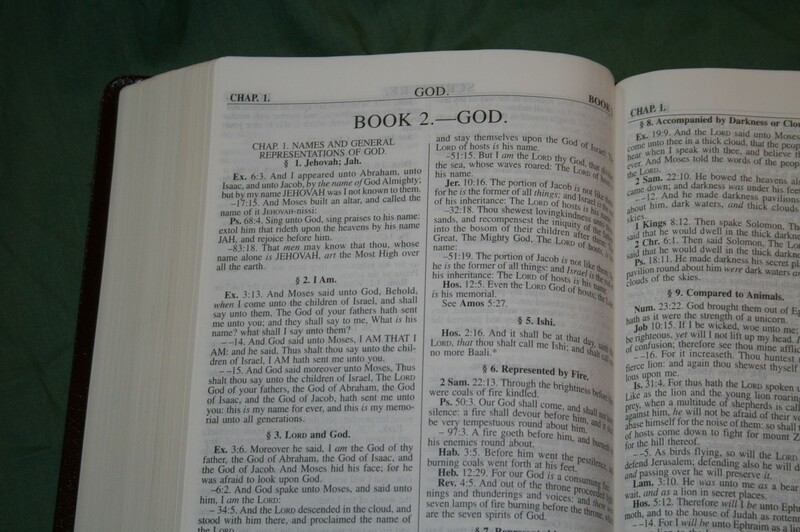 In my opinion the verse numbers would be more helpful in the regular Bible section rather than the page number. It’s easier to find it in the analysis and then get the reference from there. There are 9 line-drawn maps in the back. This is something I was surprised to see. 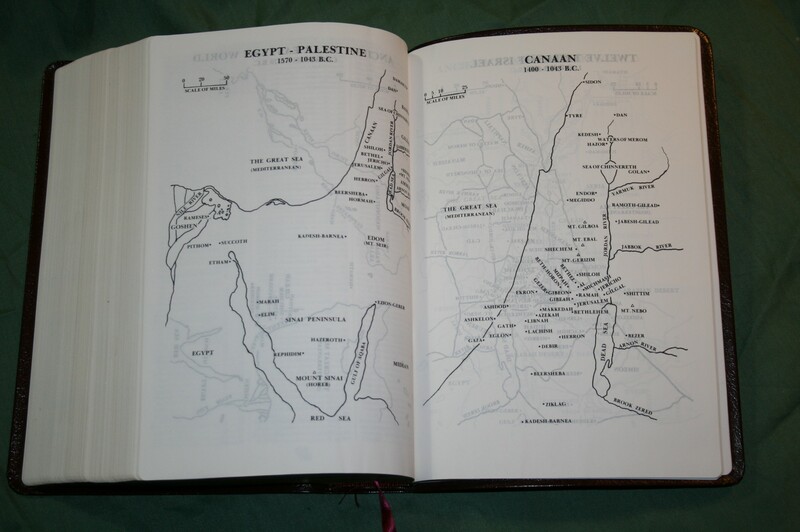 The Dugan and Jubilee editions don’t have maps. The line drawings are not in color, but hey, they’re maps. 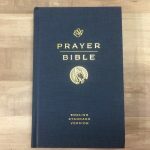 It doesn’t have cross references, translator’s notes, chapter summaries, page summaries, dictionary, or Cruden’s Concordance (the Wilmore included a few more features such as maps). These are great tools, but they also require a smaller font for everything to make it all fit. Instead of trying to be a Jack of All Trades, the focus is on a larger print, word meanings, topical index, and the topical analysis. After using this for a while I found that cross references were less needed when you use the analysis and topical index. This is a good trade-off if you want the larger print (which I do). Everything in the Dugan is printed in a small font ranging from 8 to around 5 point. 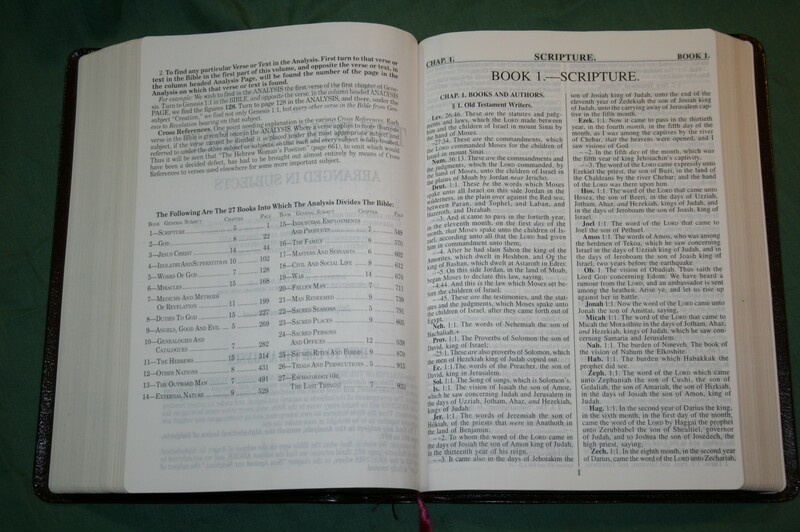 The larger print of the KJV Subject Bible makes it a good choice to preach from. I can even preach from the analysis if the verses in the list are what I need. And as detailed as the analysis is there’s a good chance the verses I need will be there. 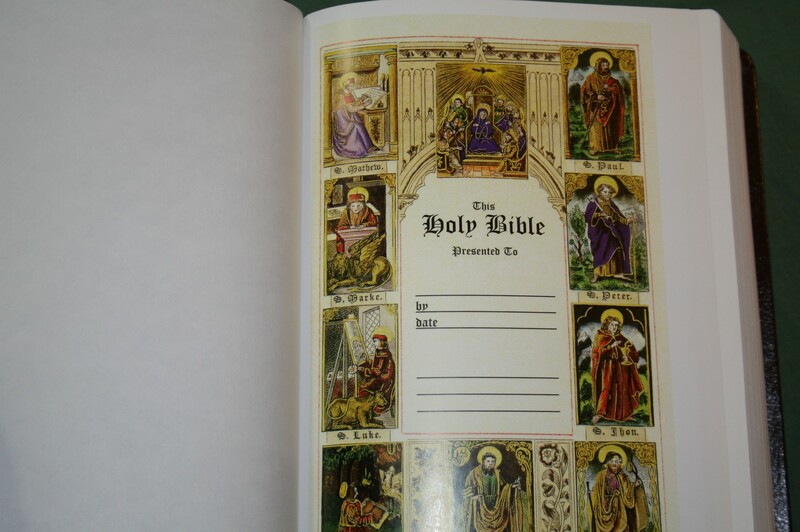 It’s also available as the 316 Mining Subject Bible. You can also get it from the KJV Store. 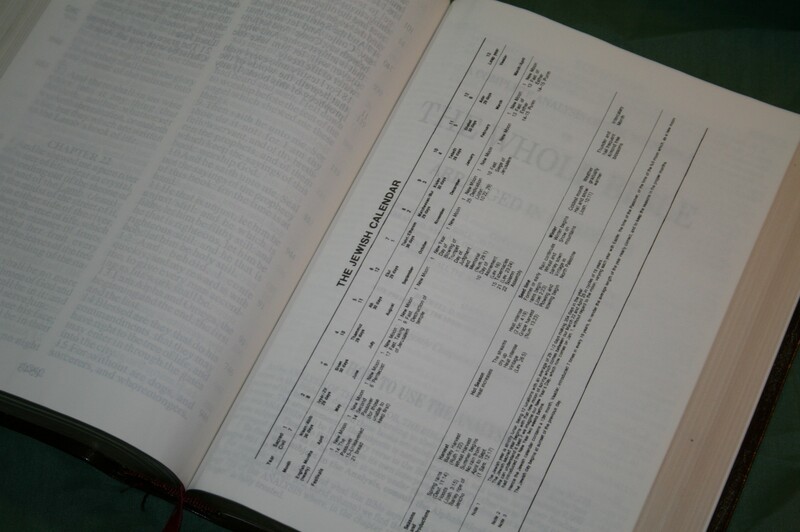 The KJV Subject Bible includes some excellent tools for topical study that allow Scripture to interpret Scripture (my favorite type of study Bible – one that gives you tools rather than telling you what to believe). It’s on the pricy side, especially considering you don’t get genuine leather, but it does have some good tools and presents them well. 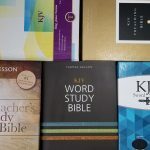 I highly recommend The KJV Subject Bible for sermon prep, class prep, and personal study, and even for preaching or teaching. Good review sir. I paid 150 dollars and bought my subject bible off es hinson’s prophetic ministry. Looks just like yours except it has a black cover. With the ministry logo on the front. Which im drawing a blank right now on the name. At first i felt ripped off cause it was advertised as calfskin. Which it most certainly is not. Not even geniune but bonded leather. The binding is sewn though. Mine has the same presentation page and articles in the front. The more i used it the more i loved it. Especially having another bible in the back arraigned by subject. I also dig the big font and archic definition s right at the end of the verse. The maps are terrible and phoned in with bad art. The king is coming is ed hindsons ministry name. I went ahead and looked it up. Thanks! I’m glad to see others are producing it. I agree with your assessment: The topical section in the back and the updated words are extremely helpful. I have the Subject Bible. 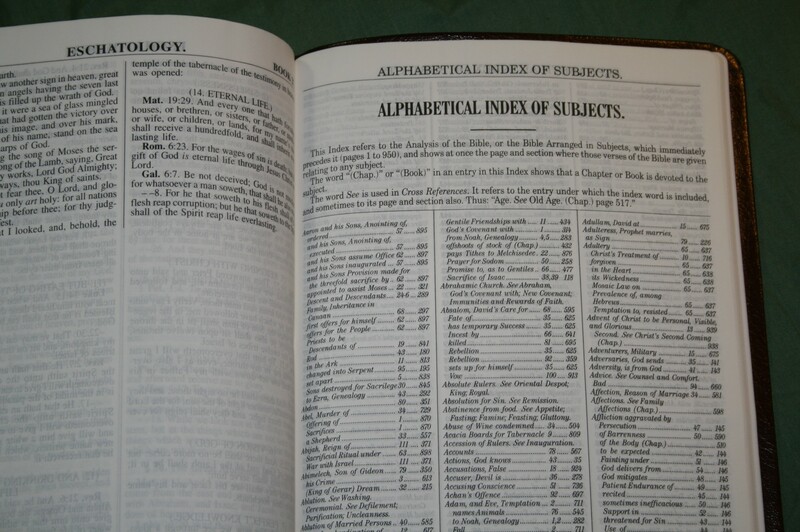 It does a couple of misprints around the difference between “alter” and “altar.” The misprints are in the first bible section and not in subject bible to which one is cross-referenced to by the first bible section. These misprints are 1 Corinthians 9:13 on page 1421 where “alter” is used by mistake. This is verse is cross-referenced to page 865 of the subject bible where “altar” is correctly used in both places. This mistake is repeated again in 1 Corinthians 10:18 where “alter” is used on page 1422. 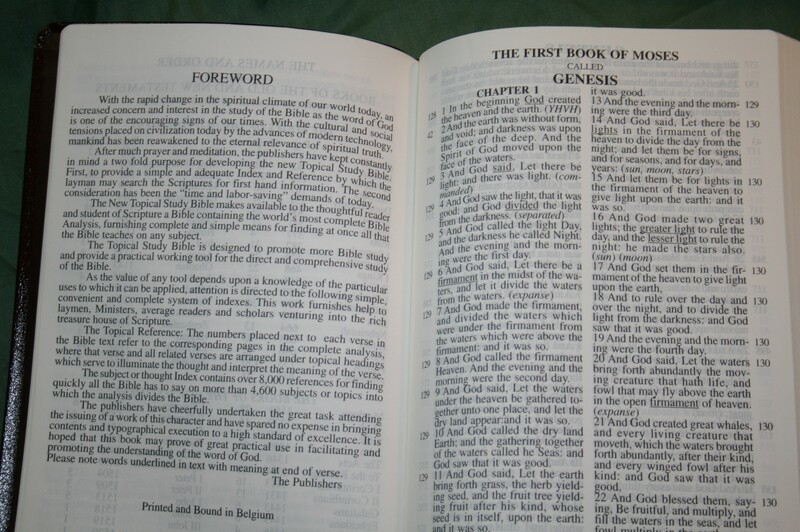 The cross reference is made to page 910 of the subject bible where “altar” is used correctly. What is the difference? “Alter” is only used as a verb. In the context of these verses, and with correct grammar, “altar” is only used as a noun. 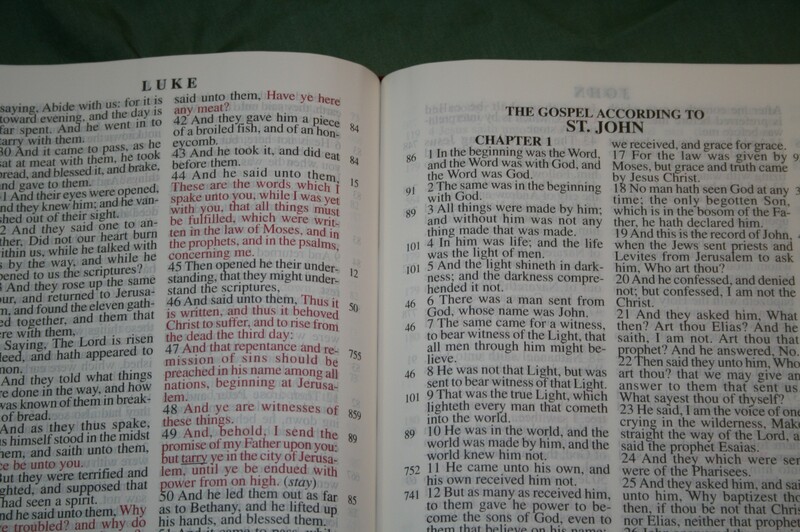 A separate misprint is at 1 Corinthians 11:15 is the cross reference to page 721 of the subject bible. This should be to page 724 of the subject bible. 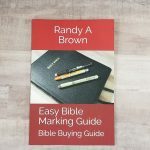 I hope this can help on future publishing of this excellent bible. Hi Robert. Thanks for the info!